Today I am sharing cards I made for my children's teachers. They will be getting these two designs plus one more that I will share on Wednesday. It is a box set for them to give out to friends and family. They will be getting 4 of each design with coordinating envelopes. 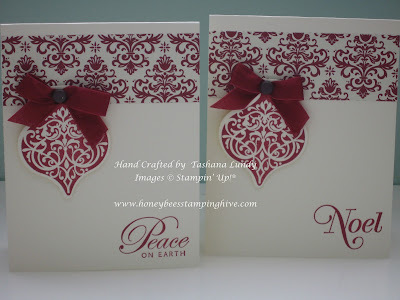 The designs came from a fellow stamper, K Kathy Baker. I changed a few things, but not much. I used Cherry Cobbler Seam Binding but the ink is Raspberry Ripple. The stamp set that I used is Greetings of the Season, found in the Holiday Catalog.